We are offering one lucky person the chance to win a huge haul of Cadbury Creme Eggs just in time for Easter! If you’re looking for an egg-cellent treat, then keep reading! “How do I enter?” we hear you ask – it’s simple! There are 2 ways to enter. One winner will be picked at random. Presentation of the prize may vary slightly to the one pictured. You must be over the age of 18 to be eligible to win. There is no entry fee and no purchase necessary to enter this competition. You must do ALL of the steps for your chosen platform. Steps for your chosen platform are stated above. One entry per person. If you enter on both platforms, you will only be submitted into the competition ONCE. Competition ends at 23:59 on 12th April 2019. All entries made after the closing date will not be valid. No cash alternative to the chocolates will be offered. The winner will be chosen at random by the AnyVan team. The winners will be notified via Twitter or Facebook within 7 days of the competition ending. If the winner cannot be contacted or they do not claim the prize within 14 days of notification, we reserve the right to withdraw the prize and pick the next eligible winner. AnyVan’s decision is final and any correspondence will not be entered into. By entering this competition, participants give AnyVan permission to use their name and picture when announcing the winner on our social media platforms and in any other promotional material. This promotion is in no way sponsored, endorsed, administered by, or associated with Facebook, Twitter, or Cadbury. You are providing your information to AnyVan and not to any other party. AnyVan reserves the right to cancel or amend this competition, including its terms and conditions, at any time without notice. Competition for UK residents only. AnyVan will deliver the prize to the customer’s UK address via post or local pick-up at our offices in Hammersmith. Delivery of the items will be dependent on stock availability. Race fans at the ready! With a fortnight until the start of the F1 season, we have created the 2019 Property Grand Prix, which gives grid positions to each GP based on the property values of the country. At the top of the grid, Monaco takes pride of place in pole position of the Property Grand Prix. Monaco is the crown jewel of the F1 calendar and boasts an incredible property cost at roughly £57k per square metre, meaning an average home value is almost £5m. On race day in Monaco, the yachts that line the harbour will also cost more than the most luxurious of homes! Lining up second on the grid is Singapore with £13k per sq metre and an average value of £1.1m. 3rd is Japan which has an average home at just over half a million pounds. The UK is the heart of F1 and is placed 9th with Russia, Azerbaijan and Mexico at the bottom of the grid. Lewis Hamilton is the current F1 champ and earnt a reported £50m last season! Breaking the figures down that is £137k a day, £5.7k an hour or £95 for every minute! A Formula 1 weekend normally lasts 3 days so Lewis bags over £410k for his three days work. This means for a weekends work Lewis can afford to buy an average property from 15 of all the 21 tracks in the race calendar. Hamilton is now a five-time Formula One World Champion and widely regarded as one of the greatest drivers in the history of the sport. Hamilton was born in the Stevenage and as we’re talking property, this means his salary last season could buy over 160 average priced homes in the area! The F1 season kicks off on March 17th in Melbourne in Australia. 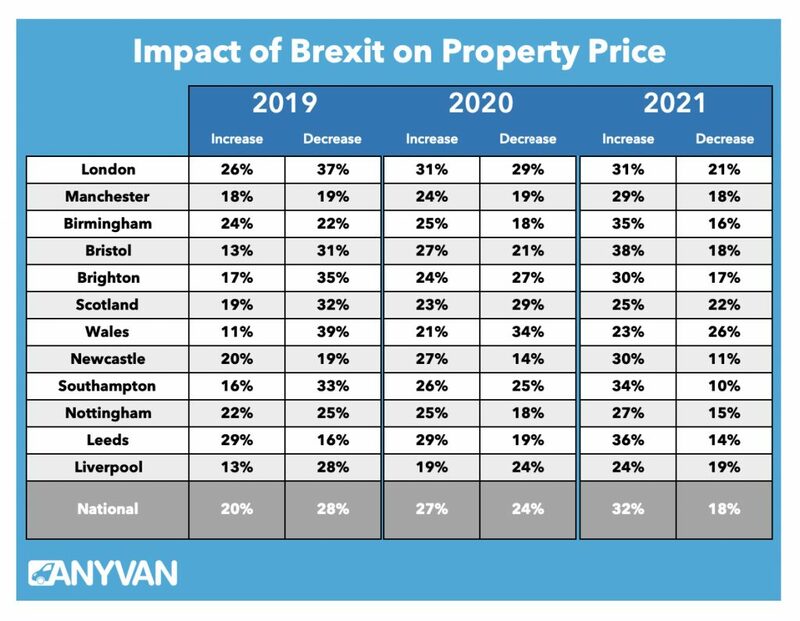 The latest report by the AnyVan.com research team shows three quarters (74%) of millennials believe Brexit will impact their ability to move in the next two years. British millennials have always lived in a country which is part of the wider European Union. However with Brexit now just 30 days away, times are about to change. The new research from AnyVan shows younger adults face the biggest challenge for a home move in the aftermath of our EU exit. 74% of under 35-year-olds indicated Brexit is impacting their ability to move in the next 2 years. Young buyers have always faced a tough task to get onto the property ladder, but with record house prices a fifth (21%) of millennials say Brexit will stop them being able to buy their first home or get a mortgage in the next 2 years. There has recently been a number of big retail casualties from the high street alongside other large firms like Honda and Dyson pulling the plug on their UK operation. 13% Brits are uncertain about their current employment and this is likely to hold them back from any home move. Both Cardiff and Leeds (17%) ranked highest for workers being uncertain about their job with Nottingham at 15%, Southampton at 12%, Liverpool at 11% and Manchester 10%. A decrease in the value of the property is the biggest worry for most homeowners across the nation. 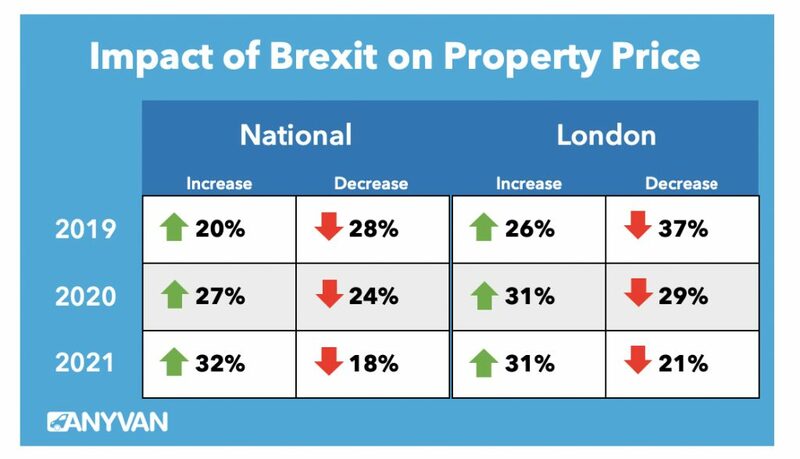 Londoners are most worried about sliding property values, with nearly 1 in 5 (19%) of owners in the Capital fearing Brexit will push prices down over the next two years. Our latest consumer research has shown nearly half of Brits (41%) do not expect property prices to increase in the next 3 years. With Brexit now firmly on the horizon, uncertainty over our imminent departure from the EU weighs on property buyer and seller confidence. Many are waiting for the dust to settle but there are many still expecting home values to increase this year. 1 out of 5 homeowners are hoping for property prices to increase over the next 12 months with this growing to over a quarter (27%) next year and a third (32%) for 2020. Moving expert Angus Elphinstone, CEO AnyVan commented “Our latest property research gives a good indicator of the sentiment of British homeowners. In the capital, the weak pound might have pushed international buyers in prime central London to its highest level for six years but for the majority of Londoners, they’re predicting very uncertain times ahead for the value of their home. 40% of homeowners in the capital do not expect to see any property price increases in the next three years. However, many are more positive on the bouncebackability of the London property market with a third (31%) predicting values to rise in 2020 and 2021. Elsewhere in the UK, Scottish and Welsh residents predict tough times ahead for property values. Over half (53%) of people in Wales do not expect to see values increase in the next 3 years with over a quarter still expecting prices to fall in 2021. In Scotland, 32% of people expect a decrease in values this year with 29% in 2020 and 22% in 2021. Leeds (29%), Bristol (24%) and Newcastle (27%) have the biggest per cent of homeowners predicting rises next year with 35% of people in Birmingham and 34% in Southampton forecasting prices to increase when we hit the year 2021.